This is a 5 DVD set, which is an A/V recording of a 6-hour seminar on fishing Crowley Lake given by the Troutfitter owner and guide, Kent Rianda, given in 2008. 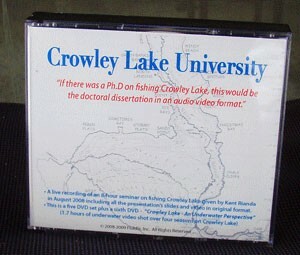 It includes a sixth DVD, which is a compilation of 1.7 hours of underwater video shot on the lake showing feeding fish as well as fish taking and refusing artificial flies The information presented was gathered over 18 years and more than 2000 days fishing and guiding on Lake Crowley by the author. It is a complete treatise on the subject . . . If there was a Ph.D. on fishing Crowley Lake, this would be the doctoral dissertation in an audio-visual format. If you are a serious still water angler, or just want the information to catch more fish on Crowley Lake, this presentation belongs in your library! Fish never feed down - wrong! Using fish finders for trout . . .
Be ready to go at anchors away. It's the Fly, Not the Guy! Fluoro tippet and leader - Mandatory? Indicator antics - what was that? Dr. Lindstadt is in town. Heave it and leave it. It's the guy, not the fly! Line selection . . .
Knowing what depth you are at . . . Choosing the right line . . . Using a stomach pump - properly!